Palazzo Medici Riccardi - FLORENCE LIVE! Home of the Medici for 100 years from 1444, the palazzo was later acquired by the Riccardi family and now houses government offices. 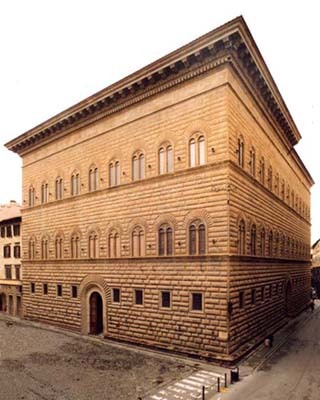 It was built to an austere design by Michelozzo for Cosimo il Vecchio, who rejected Brunelleschi's original plans for the palazzo as being too flamboyant -- Cosimo did not want to be seen flaunting his wealth to his rivals. It was built to a plan by Michelozzo from 1444 to 1464. In 1517 the open loggia on the ground floor was walled up and the pedimented windows attributed to Michelangelo were added. In 1655 it was acquired by the Riccardi family who added on to the facade and the whole building. The palace, which once belonged to Lorenzo the Magnificent is now the seat of the Prefecture, also contains the famous frescoes by Benozzo Gozzoli of the Arrival of the Magi in Bethlehem in its Chapel. Painted in 1459-1560, the fresco portrays the personages present at the Council of Florence in 1439. Shown in the work are John VII, Lorenzo, Piero the Gouty with his daughters, Galeazzo Maria Sforza, Sigismondo Malatesta, as well as Benozzo himself and his master, Fra Angelico. Through the main door, the courtyard walls are covered in ancient Roman masonry fragments. Donatello's statue of David (now in the Bargello) was originally here, but today the place of honor is given to Bandinelli's marble statue of Orpheus.